Occurs worldwide wherever wheat is grown. It is most important where dews are frequent during the jointing through flowering stages and temperatures are mild, 15-25 C.
Losses over large areas are generally light to moderate, 1 to 20%. Individual fields can be destroyed when the disease is severe prior to heading. Losses are often the greatest in years most favorable for wheat growth, thus, high yields and higher losses often occur together. Losses are more frequent in fall seeded wheat or in spring wheat nearby fall seeded wheat. Grain shrivels and nutrients produced primarily in the flag leaf are used by the fungus rather than transported to the grain. Early infection can result in weak plants and poor root and tiller development. Uredinia normally appear on the upper leaf surface, but with severe epidemics sheath infections can occur. Uredinia are brown in color and generally circular in shape. Uredinia seldom penetrate through the leaf. Development is favored by mild days, 20-25 C, and nights, 15-20 C, with adequate moisture for night time dew development. Wind enhances urediniospore dispersal during the day; calm nights enhance dew formation. Windborne spores involved in interregional transport are rain deposited. The source of inoculum is generally from overseasoning mycelium or uredinia on volunteer plants. Regional transport of urediniospores by wind may introduce a new virulent race in an area, but probably seldom results in a severe epidemic that season except on the most susceptible cultivars. Aeciospores from the alternate host (sexual) rarely result in a epidemic. Urediniospores optimally germinate when in contact with free water at an temperature of 15-20 C. Penetration is through the stomata. Latent period varies from 8-14 days in the field with temperatures of 10-25 C. With temperatures of 5-10 C latent periods of several weeks are common. Leaf rust survives between crops as mycelium or as uredinia on infected volunteer and/or on early sown and late maturing wheat crops. The pathogen can survive almost any condition the host leaf can survive. 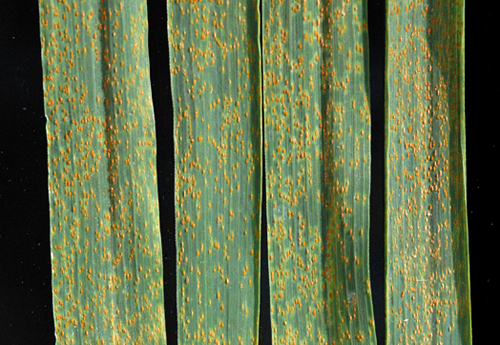 Leaf rust is disseminated by wind blown urediniospores. Regionally transported urediniospores are generally rain deposited. Triticum species and the man-made crop Triticale are the main hosts. Other formae specialis attack a wide range of grasses. 1. The use of resistant cultivars. 2. Control of volunteer wheat and seeding dates. 3. The use of fungicide sprays. Browder, L. E., 1971. Pathogenic specialization in Cereal Rust Fungi, especially Puccinia reconditaf. sp. tritici: Concepts, methods of study and application. U.S.D.A. Agric. Res. Serv. Tech. Bull. No. 1432, 51 pp. Dyck, P. L. and Kerber, E. R., 1985. Resistance of the race specific type. Pages 469-500 in: The Cereal Rusts Vol. II: Diseases, distribution, epidemiology and control, A. P. Roelfs and W. R. Bushnell eds., Academic Press, Orlando, Fl. Saari, E. E. and Prescott, J. M., 1985. World distribution in relation to economic losses. Pages 259-298, in: The Cereal Rusts Vol. II: Diseases, distribution, epidemiology and control, A. P. Roelfs and W. R. Bushnell eds., Academic Press, Orlando, Fl. Samborski, D. J., 1985. Wheat leaf rust. Pages 39-59, in: The Cereal Rusts Vol. II: Diseases, distribution, epidemiology and control, A. P. Roelfs and W. R. Bushnell eds., Academic Press, Orlando, Fl.